In yesterday’s post, I talked about how to run a script to export all of our Microsoft Project schedules into XML files. In this post, I’ll provide the script to import these into a new instance of Project Server – either on-prem or online. Note that this script will not import custom fields – but could be easily adapted to capture and transfer custom fields. Note also that there are other third party tools that do much of the same thing, but better. Caveats aside, if you followed yesterday’s post, you should now have a directory called C:\Exports that contains all of the exported project schedules in an XML format. 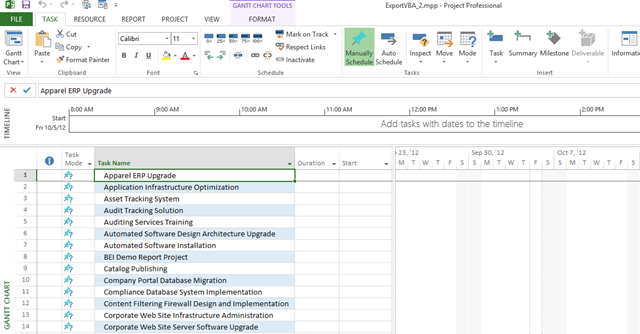 You should also have a Microsoft Project schedule containing a list of all of the projects you wish to import. Application.FileOpenEx Name:="C:\Exports\" & fName & ".mpp", ReadOnly:=False, FormatID:="MSProject.MPP"
Application.FileSaveAs Name:="<>\" & fName, FormatID:=""
…and run to import the files. 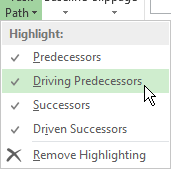 You will probably need to click through the prompts as they appear. Pair this with a utility to publish all of the projects like the one Alex Burton wrote here and you’ve now moved your projects from one environment to another. This question comes up in the forums pretty frequently, and in fact, I’d actually spec’d out a similar procedure for on-prem Project Server installs which involved hitting the Reporting Database to figure out the Project Owner. I am not sure how useful this code really is, but I was curious about how hard it would be to consume OData values with VBA and then manipulate Project desktop data with the results, and hence spent a couple cycles figuring it out. I basically took his work and repurposed it to work with Project. Specific fields are available with Project Server but not available within the Project Client. Most notably, these fields include the Enterprise Project Type field or the Project Owner. There are a number of scenarios that could be enable through making these fields visible in the Project Client. For example, I would like to flag the project when the Project Owner has changed, as many organizations forget to change the Status Manager field – and as a result the task updates all flow back to the original Project Owner. In Project Online, we can’t consume the database data, and must instead consume the OData feed from Project Server. Flags tasks where the Status Manager does not equal the Project Owner. 'Given a URL, reads an OData feed or entry into an XML document. 'Make a request for the URL.
' Get the result as text.
' Create a document from the text. ODataURL = PWAURL & "/_api/ProjectData/"
StartTag = "<d:" & GetParam & ">"
FinTag = "</d:" & GetParam & ">"
MsgBox "The Project Owner has been changed. You should change the status manager. ", vbOKOnly, "Reminder"
'Store the current status manager for the next iteration.